A porcelain doll requires special care. Porcelain is a type ceramic made by heating raw material, such as clay, to a high temperature in a kiln. Making dolls from porcelain has become a global art form. 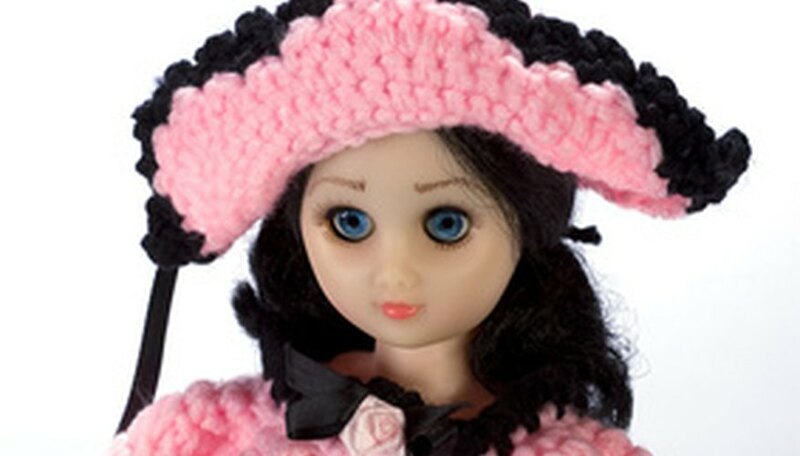 Many of these dolls are collector’s items with intricate designs and period costumes. The doll’s hair, glued on as a wig, is made with either real human hair or a synthetic material. Cleaning the hair of a porcelain doll is not a complicated process, but it requires some patience and gentle handling. Gently remove the wig base from the doll. Work your fingers under the edges and slowly pull the wig free. Do not use a tool of any kind. This will scratch the porcelain. Be patient and careful. Spray on a little water if you have a difficult spot. Wet the hair with cool water. Spray the hair with a window cleaner. Do not use shampoo. Work the cleaner through the hair with your fingers. Rinse the hair thoroughly. Apply hair conditioner or a liquid fabric softener to the hair and work it through with your fingers. Rinse thoroughly. Comb out the hair with a pet hairbrush. The metal tines of a pet brush are better suited for the wig and less damaging to the base. Allow the hair to dry. Gently remove the wig from the doll's head. Work your fingers under the edges and carefully pull the wig base free. Stubborn spots might require a quick spray of cool water. Work slowly and be patient. Comb out the wig with a hair pick. If you have problems, spray on a tangle remover available in stores near the hair conditioners. If the hair is pulling out, switch to a soft-bristle brush. Soak the wig in cold water and a fabric detergent for delicate articles for 10 minutes. Set it aside on a towel. Fill the sink with cool water and two drops of vinegar. Dip the wig in the sink as needed to remove the detergent. Towel dry the hair by laying it out on an absorbent bath towel and spreading the hair out. Fold the towel up at the edges and blot as much water out of the wig as possible. Transfer the wig to a clean towel and let dry. Paint a small coating of white glue over the hair area of the doll's head. Carefully position the wig and hold it there. Let the glue dry enough so that it becomes tacky. Wipe off excess glue. Set the doll aside to allow the glue to dry. Do not attempt to remove a wig made of mohair. Just sprinkle cornstarch into the hair and comb it out with a toothbrush.